It's been a relatively quiet couple of weeks with regard to Packers news outside of draft speculation. About all we've had for headlines recently: yesterday it was revealed that the Packers will wear a commemorative patch for their 100th year of play this season, and that they will likely open the season at home in prime time. 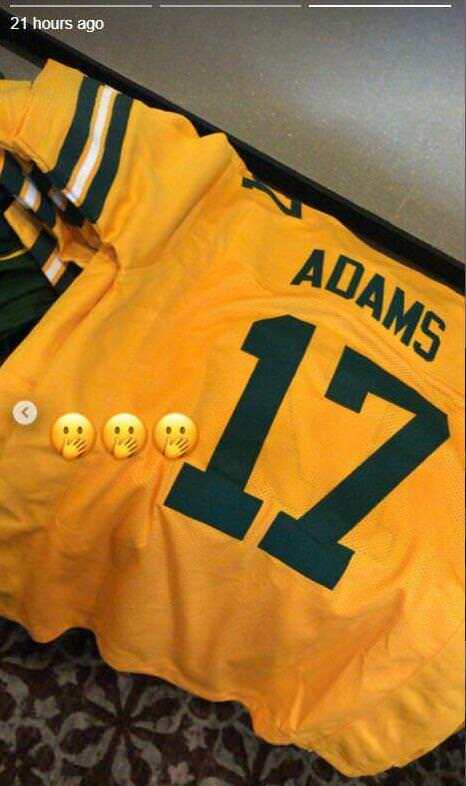 Could it be that the Packers have decided to go with a yellow color rush jersey this year? Some of the Madden video games have featured all-yellow alternate jerseys for the Packers, but the team hasn't sported an all-yellow or gold jersey in decades. The last couple years of wearing all whites has always felt like somewhat like the Packers respectfully protesting what is at best a gimmicky marketing trend and at worst a visual nightmare, especially for the red/green colorblind. The Packers typically don't provide information about uniforms for the season until the shareholder's meeting, which is still a couple months away. So, this could be a legitimate uniform, or it could just be an ugly collector's item. Thoughts on an all-yellow color rush jersey? Oh, please no. Our players will look like escaped ears of corn running down the field. I can think of nothing else. I am consumed. TK: lol. Consumed? Yes, the uniforms will win us games. Lmao. Uniforms should be our #1 priority. Go uniforms!! Will they make us faster? If so, I’m all for them. At least those ugly “ throw back “ uniforms will be gone. I agree 100%. Those throwback uniforms are the ugliest & stupidest looking things I've ever seen in any professional sport. "I agree 100%. Those throwback uniforms are the ugliest & stupidest looking things I've ever seen in any professional sport." Worztik: Perfect for MM. I think he wore that already though in the Seattle championship game meltdown didn't he? I try to forget... brighter days ahead? Still wouldn't have helped Favre, he was color blind. Is that an INT reference?? I do believe... a very subtle one!!! I prefer subtlety that’s a little more obvious. Like a cleaver to the head. I've always wanted to see a yellow jersey in the NFL. NOBODY wears one. Have wondered over the years how we'd look with a yellow/gold jersey, forest green pants, and either a white, or forest green helmet. FOX is doing away with color rush uniforms this season for Thursday night football, so if we use this one pictured, it will be our choice as an alternate jersey. As long as we're on uni talk, I wish Ron Wolf's proposed changes to our unis had gone through all those years ago. Blue and gold is sharp. Not jersey color... they did wear a yellow/gold jersey one time for their color rush Thursday nigher last season. Rams wear blue or white for jersey. No team has yellow or gold as the main color for their jersey. I think that's odd with 32 teams not one wears it. I'd like to see an all-green uniform that matches the color of the turf so the team is invisible and all you see is the ball floating around. Irish: Invisible? Kinda like our defense huh? And coaching. Quite? Ha. Sound asleep. Worried about uniforms? My goodnes, that's all they can write about. The Packers have had visits to throw fans a bone. As far as change, not really. It will still be draft, FA leftovers, and develop. Does anyone agree with me. We are hurting for cap space compared to many other teams. Why? TT and Russ Ball poor planning and overpaying some players who are no longer productive and miss multiple games! So what really has changed? I have been following the Pack since 58 and I see little change. Hope? Develop? Only constants: Farve and Rodgers. Other then that, help me out here. DD you nailed it! Terrible Ted has been reincarnated in the form of Gute. Active in FA? HA! This is the same ol same ol. Gute lickin TT's chops waiting to bottom feed on the undrafted FAs. You know the players that 32 teams looked at and didn't want. Did the Packers bring in uniforms for a visit? Keeping MM, TT and Ball real busy. Please, don't overspend on the uniforms, God knows we need the money to sign some leftover FA's. Lol. Stay with the white. Compared to other teams, like the hags neon lime, the all/white uniforms look professional and cool. Please, please no yellow! Forest green, but that’s a road color. I liked the '29 Throwbacks. Rush it and flush it, the whole concept stinks. What a cheesy marketing gimmick this is. Yellow, white, crayola crayon pink, who cares. Can't just we just wear our Green and Gold and concentrate on playing football. Don't these teams make enough money? The color rush jersey is dead per the NFL. Stay focused. I don't think the mustard yellow top looks bad at all. Wouldn't want the whole uni one color, but if the yellow top ( darker yellow, not the canary yellow) was paired with perhaps white pants, I wouldn't mind it at all as an occasional alternative. The Brewers do it from time to time and I think it looks good.